The flight instructor and designated pilot examiner from Vernon, Texas, has set a goal to administer three successful checkrides to women each month during the year. She has met that goal so far, starting on New Year’s Day when she handed a temporary pilot certificate to Samantha Rawlins, an 18-year-old aerospace engineering student. Latimer is driven to boost the numbers of women pilots. Her daughter, Tamara Latimer Griffith, and granddaughter, Amanda Griffith, share that vision. They are a rare segment of the pilot population—three generations of women pilots. That may explain some of their motivation. The percentage of women pilots has languished at around 6 percent for decades. There’s a host of theories as to why women aren’t as likely to pursue flying, ranging from psychological considerations, such as fear and intimidation, to practical ones—mainly the time and cost of flying. those obstacles that are holding you back. Let’s get you into the air. She called it Girls in Flight Training Academy (GIFT). Twenty women accepted the offer. Mary, husband Lawrence Latimer, Tamara, and a crew of volunteers taught ground school and gave flight instruction in borrowed airplanes. Amanda—just 17, and a private pilot—helped out with logistics. By week’s end, two women had taken checkrides; two had soloed; four passed the knowledge test. Tamara occasionally accompanied her mother to CFI and IA refresher courses, sometimes sitting in on the classes. During breaks, she sometimes heard the men in the class talking about Mary—remarks such as “too pretty to be a mechanic,” and “very smart for a pretty girl.” Sometimes the comments were rude. At the time, Griffith didn’t understand the context and wasn’t cognizant of the fact that her mother usually was the only woman in the course. Lawrence and Mary taught Tamara to fly, and she quickly added certificates and ratings, as well as the A&P and IA. She became a flight instructor “because it was expected of me,” but didn’t have enough hours to find a corporate or freight job. In 1990 she took a contract mechanic position with the U.S. Drug Enforcement Administration in Addison, Texas. At 19, she was the first female mechanic at that location. “My team left me to remove a prop from a Navajo, basically deciding that I was not a real mechanic,” she said. An older mechanic on another team watched from the sidelines, then stepped in to help her. She found fewer hurdles as a professional pilot, though in an ironic echo of her mother’s experience, as recently as 2009 she was turned down for a position because the owner was afraid his wife might not like him flying with a female pilot. Today, Griffith is an independent flight instructor as well as a ferry and charter pilot, and a mother to three children and three stepchildren. Amanda, the eldest, is a flight instructor. Griffith’s middle daughter is learning to fly; her son is “looking forward to his training but dreading it also,” she said. Like her mother, 19-year-old Amanda Griffith grew up around airplanes. “For the most part, because I didn’t have any other reference on how it was supposed to be, it didn’t seem abnormal,” she said. She soloed five airplanes on her sixteenth birthday. an aerial application pilot in 2013, balancing the seasonal cropdusting schedule with college coursework toward a business degree. Between those jobs, she has logged more than 1,000 hours and earned an FAA Gold Seal instructor certificate—all before the age of 20. Given a choice, she admits to being an adrenaline junkie and to a love of aerobatic flying. Amanda hasn’t encountered the sexual stereotyping that her grandmother and mother experienced. She has endured what nearly every young flight instructor encounters when working with older flight students: that moment of disbelief when students see that their teacher is young enough to be their daughter. It doesn’t bother Amanda. “Sometimes…they’ll kind of look over at me in the airplane, [thinking] Am I really taking orders from this little girl? I’ve seen that look a couple of times. “Once they understand that I have a handle on the situation, they tend to calm down,” she said. Mother, daughter, and granddaughter plan to continue to help women find their wings. In 2012, the percentage of women pilots with a private or higher certificate fell to 5.29 percent, down from 5.34 percent in 2011. (It’s worth noting that the entire pilot population decreased over the same period.) Latimer isn’t deterred. She knows that for every successful pilot GIFT produces, “we are able to inspire so many more. Mary Latimer has always intended that other flight schools emulate the Girls in Flight Training (GIFT) model—a weeklong, women-only event—as a means to get more customers and create more pilots, but the prospect of providing low-cost or free instruction is a showstopper for many. “They say, ‘I can’t afford to offer free instruction,’” she says. “I say, ‘If you’re looking for students, you can’t afford not to.’” She’s had a lot of follow-up business from GIFT participants who return to Vernon for flight instruction. Meanwhile, a Recreational Aircraft Association chapter in Winnipeg, Canada, is offering a Cessna 150 for $20 per hour, available only to women pilots. 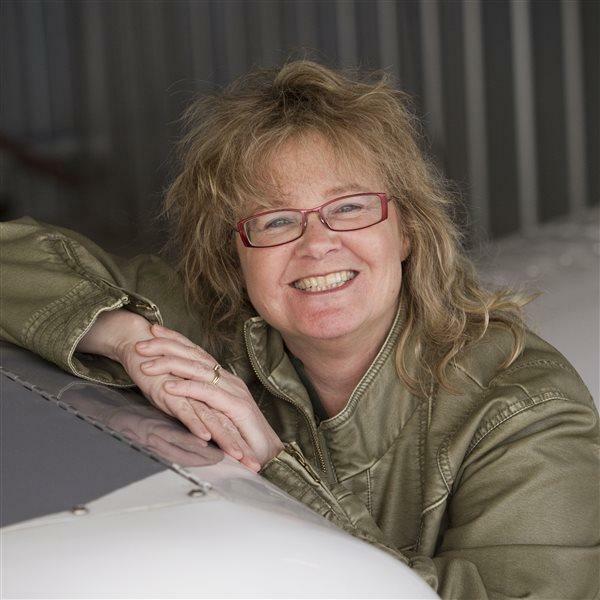 Jill Oakes, who spearheaded the project, is working with local flight instructors who have agreed to teach free ground school classes for women. Latimer will host Girls in Flight Training again this year, October 19 through 25, at Wilbarger County Airport (F05) in Vernon, Texas. Space is limited. For more information, see the website. Encouraged, Latimer put out the word again in 2012. Forty-five women came, but Latimer and her crew were ready. They even had a brand-new CFI: Amanda, who had taken her checkride days before and taught her very first students at GIFT. In one week, four had soloed; 10 had passed the knowledge test; and four had completed the private pilot checkride. GIFT 2013 had so many applicants that Latimer had to turn some away. She decided to form a nonprofit so that the program could expand (www.girlsinflight.org). GIFT received donations of a Piper Cherokee 180 and a Cessna 172. When GIFT is in session, attendees pay only for fuel. The rest of the year, the airplanes are available to women student pilots for $30 per hour to defray the cost of maintenance and insurance. Latimer took her first flight in 1970, while dating her husband-to-be, Lawrence Latimer. They married in 1970 and she became a private pilot in 1972. Working to establish an aviation business at Wilbarger County Airport, the Latimers decided that one of them needed to get an airframe and powerplant certificate. “The mechanic license was so we could buy, rebuild, and sell airplanes,” she said. “Someone had to have a license. Lawrence made more money, and I was a better student, so it was logical for me to be the one to go to school.” In 1973 she enrolled at Texas Aero Tech in Wichita Falls, where she was the only female student in a class of 20. “They thought I was joking when I went to the school to enroll,” she said. She wasn’t joking. Latimer earned higher grades than anyone else in her class. She later learned that her instructors had a betting pool on her. None of them thought she would last longer than two weeks. Tamara, the Latimers’ only child, would ride in the back of a 1939 Aeronca as her mother flew from Vernon to Wichita Falls. Tamara stayed with her grandmother while Latimer attended classes, then they would fly home together. Adding commercial, multiengine, and flight instructor certificates in 1974, Latimer found flying jobs hard to come by. She related a couple of “memorable turndowns”: “We don’t think the students would fly with a female instructor,” and “We have a lot of overnight trips and my wife wouldn’t like it.” She applied to become an air traffic controller and was hired in 1976. Once again, she was the sole female in the class of 18. She finished second in the class and was sent to Lawton-Fort Sill Regional. In 1999 she transferred to Fort Worth Meacham International and worked there until retiring from the FAA in 2002. In the ensuing years, Latimer has continued to fly as a CFI, ferry pilot, and corporate pilot. She became a designated pilot examiner for the Lubbock Flight Standards District Office in 2009. In 2013, she was named FAA Southwest Region Flight Instructor of the Year.